Will they help you leap tall buildings in a single bound? 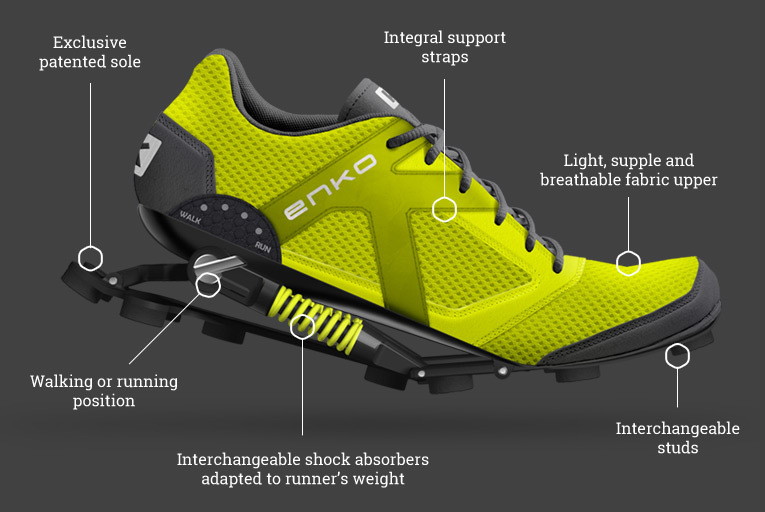 Well, not quite, but Enko running shoes hope to provide unbeatable shock absorption, all while making you look semi-bionic. Using a slick little dial on the side of the Enko, you can switch between walking and running positions, which adjusts the tension at the heel. Interchangeable twin shock absorbers are geared to your specific weight, and with every stride the energy that would normally be dissipated (or pounded into your knees), is stored and used to launch your next step. Created by avid runner, Christian Freschi, the shoe has been 12 years in the making. The French based family business will begin crowdsourcing the 1st of February. Your very own pair of Enko running shoes can be had starting at a $390 contribution at their Indiegogo page.